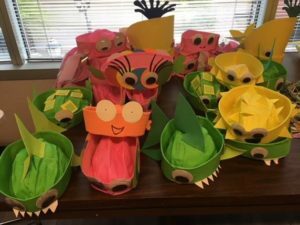 On Friday, June 29 Launch Workplaces in Gaithersburg held its first quarterly “Launch into Good Works” community project supporting the Washington DC charity Only Make Believe. The project was coordinated by Launch Workplaces members Vendor Centric and DRD Creative. The purpose of the project was to make costume hats and necklaces for sick children in local hospitals, which actor volunteers from Only Make Believe will use to entertain the children. 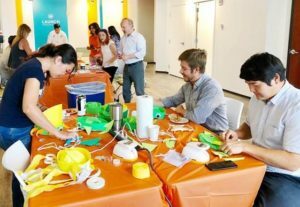 Over a two hour period, Launch members could drop into the Media Conference Room at Launch to assemble colorful hats of an under-the-sea theme featuring turtles, sharks, whales, and jelly fish. The hats were designed in advance by DRD Creative, and fifty were completed during the project duration. They will be delivered to the charity along with a generous donation provided by The Brick Companies Foundation, the parent company of Launch Workplaces, and other cash donations collected. “We were looking for a project we could do in-house that would unite everyone. Making fun hats for Only Make Believe was the perfect choice. We hope our creations will bring joy to the kids,” said Tom Rogers, CEO of Vendor Centric. While Launch Workplaces members have always been charitable during the holiday season, the Launch into Good Works program was established to do more in the community and foster teamwork. “Our members are the best! 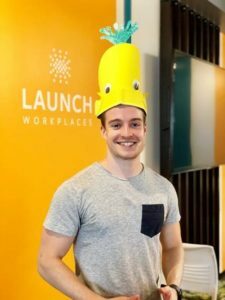 It’s great to see different companies coming together to support one purpose,” says Karen Kalantzis, Community Development Manager for Launch Workplaces. Launch Workplaces provides cost effective office space solutions with private offices and coworking in Gaithersburg and Rockville. A new site in Bethesda is opening August 1.